What does a gopher look like? 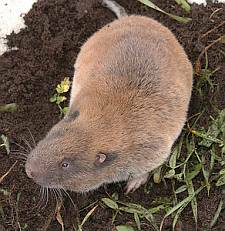 Is a pocket gopher causing the damage in your lawn and garden? Those are smart questions to ask. Anytime you have a pest problem, identification is the necessary first step. Your best chance for success in eliminating the problem is to be certain that the approach you take is targeted at the right pest. The following photo series will answer not only the question “What does a gopher look like?”, but also show gopher holes and mounds. This combination should help you to make a confident decision on what you are dealing with and what to do about it. Coming Out Of Its Hole? 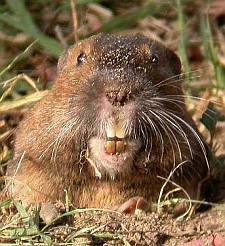 This gopher has created a mound of dirt in the classic shape for a pocket gopher. He has pushed the dirt out of the exit tunnel so that it surrounds about three-fourths of the hole. He simply keeps pushing it out and over the top. If you watch a gopher digging out a tunnel, he will often poke his head out slightly and check for danger before he will exit the safety of the hole. When he is ready the gopher will dart in and out very quickly. His sense of smell is excellent, his sight probably limited, coming into bright light. His hearing is good, and he will often stay hidden if he hears/feels any activity moving around above him. The main tunnel he is excavating would not be under the mound. It would be behind him (to the left of the picture), as his exit tunnel would angle down to meet the main runway. When you can locate the plug in a finished gopher mound, it will be off to the flat side of the mound, where you now see the gopher. This gopher photo shows the little rascal that many people find cute - when they aren’t thinking about the damage he causes. The beady little eyes should give him away - this guy carries on criminal activities! He has small ears that do not protrude from his head. This will help those who might confuse his head with a mouse or rat. His whiskers are obvious, and they function just like with other animals. A gopher is alert to changes in his tunnel. If a human or animal predator widens the tunnel, his whiskers will sense the difference. His prominent front teeth are barely visible in this picture. These photos are all pocket gophers, which seems to be the most common variety for which we receive questions. Other types of gophers, many of them larger, will be featured in a later article. 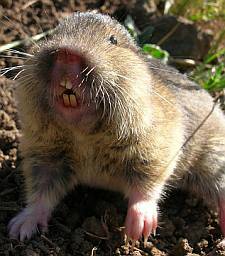 Here is a picture of the classic gopher teeth. Quite a smile. Doesn’t look quite so cute from this angle. These teeth can do quick damage to roots of plants, as well as plastic pipes and electrical wire that are buried in its path. Notice the bulging cheeks. When a pocket gopher finds a food source, he’ll bite it to smaller pieces and carry it to a food burrow. His fat cheeks are actually folds of fur lined skin on either side of his head that form pouches. These make a pocket to carry the food, rather than holding it in his mouth. At the bottom of this gopher picture, you can see one of the long claws that make him such an effective digger. You might expect a small rodent like this to behave as a mouse or rat or ground squirrel would do, take off running. He would, if he is right at his tunnel. But a gopher that encounters danger when he is above ground will face any threat. It doesn’t matter if it is a human, a cat, dog or even a large bird like a heron. The gopher will meet any challenger head on. Does he think he stands a chance against any attacker? Or does he instinctively know he’s not fast enough to win a race to the exit? Whatever the reason, when you see these teeth, and this stance, you know it’s gopher season. 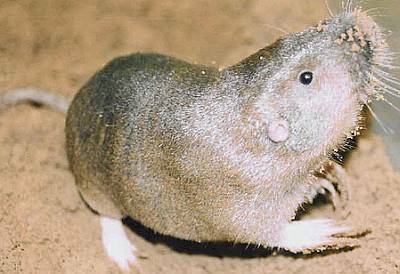 Here you see the compact form of the pocket gopher. This one is rather broad, so he/she is mature. Gophers will expand a tunnel to fit their own size. They dig new tunnels and they take over existing runways. If the original tunnel was dug by a young or small gopher, the new guy that moves in may have to do some more excavating. This will produce less dirt than a new tunnel, which is why you see such a variation in the amount of dirt that is left in mounds above ground. This view presents the gopher as harmless looking as a hamster. Their bite would be much worse! A gopher has fur similar to a hamster. 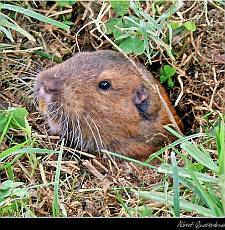 The adult gopher should be larger than a hamster. It will have a longer tail, though not as long as rats and mice. In this final gopher picture, you see that he has the long claws for digging on all feet, though the front claws are longer and heavier for doing most of the work. The body is streamlined with no obvious neck. Again, the small eyes and ears are distinctive, as are the stiff whiskers. The tail is thick and almost hairless. It can be used by the gopher as a sensor probe when it has to back up in a tunnel. In this photo the tail appears quite long, but it typically is only an inch or two at the most. Earlier you saw a typical gopher mound. They don’t always look quite like that one. The shape and size will vary quite a bit, although there is usually some resemblance to a fan shape. If it is obvious or can be found, the exit hole will be off to the side. By contrast a mound made by a mole will probably resemble a volcano, with the hole found right in the center. 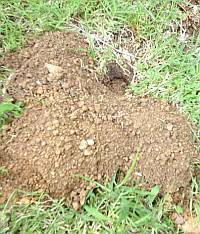 Moles also make raised paths that are noticeable, since they tunnel near the surface, looking for grubs. 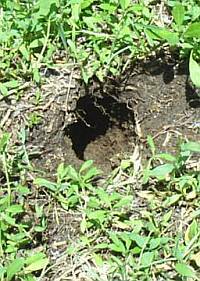 Gopher holes are sometimes present with no dirt distributed above ground. This could be an exit hole from an older tunnel that is being cleaned out by the new occupant. There may be minimal excavation work, or the dirt is pushed elsewhere. It could also be what is called a feeder hole. Gophers do not spend much time above ground, but they will pop out on occasion. Often a feed hole is noticeable because any vegetation surrounding the hole may be trimmed down. Even though the hole is open at ground level, there is probably a plug further down, if the gopher is not actually conducting his little forays for forage. 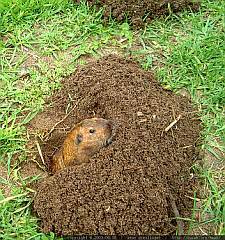 Gophers will not leave a tunnel open for any length of time, to deter predators. Hopefully this answers your question on what does a gopher look like. If your next question is what to do about gophers, take a look at a series of articles that will help you accomplish the task of gopher control. The first topic is: How To Get Rid Of Gophers.